World Travel Market London is delighted to announce the city of Madrid and World Pride - the world's largest Lesbian, Gay, Bisexual and Transgender (LGBT) event - as key exhibitors in its LGBT Village. The city of Madrid will host World Pride 2017 and the Spanish capital and the event will feature prominently at the LGBT Village exhibition space hosted by ONBC at the leading global event for the travel industry, WTM London (Monday 7 - Wednesday 9 November). The WTM London LGBT Village - hosted by the leading global travel trade association Out Now Business Class - will take place for the sixth consecutive year in 2016 connecting 1,000 global tourism industry professionals to better service the needs of the LGBT community. ONBC is a travel networking initiative of Out Now. Chief Executive Officer Ian Johnson — recently named one of the world's 'Top 10 Diversity Consultants' in the Global Diversity List, supported by The Economist — said he is delighted to welcome World Pride Madrid 2017 and Madrid Destino as important exhibitors in the WTM London LGBT Village. "Madrid enjoys a well-earned reputation as a welcoming destination that embraces diversity — and the city's annual Madrid Pride has become a true 'must-see' event on the global LGBT tourism calendar," said Johnson. "We are pleased to welcome Madrid Destino with World Pride Madrid 2017 to ONBC's official LGBT Village at WTM London. Madrid is a destination that LGBT people fall in love with over and over again, so the World Pride event makes 2017 the ideal time to visit. The global travel industry is going to make many valuable business connections with the city of Madrid and World Pride Madrid 2017 through the LGBT Village at WTM London." Madrid Pride is already one of the city's best-known festivals, open to the LGBT community and anyone who wants to hit the city's streets to celebrate diversity. Attendance has grown every year; and one and a half million people gathered in the capital for the 2016 celebration. Pride has now become a major event for the entire city. The World Pride 2017 programme starts with an Opening Ceremony on June 22, 2017 and runs until July 2, 2017. Highlights will include an International Human Rights Conference (26-28 June 2017) and an International Culture Festival. World Pride Madrid 2017's main event is the Pride Parade. 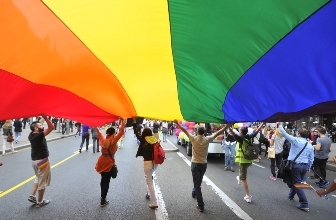 This large international LGBT Pride celebration is projected to see more than two million people from all over the world marching through the city's main streets in an event celebrating diversity and equal rights. Coinciding with World Pride, next year Madrid also simultaneously hosts EuroPride 2017 — making the city the stage for two of the world's most important LGBT community celebration events. Manuel Santiago, marketing and promotion coordinator World Pride Madrid 2017 from Madrid Destino, said he was pleased to be joining as an important member of the WTM London LGBT Village. "Madrid is a place with many reasons to visit and we are pleased to be adding even more with next year's World Pride Madrid 2017 celebrations," said Santiago. "We think it is essential that we be part of ONBC's official LGBT Village at WTM London as this is a powerful opportunity for us to connect with key members of the global tourism industry to help them make sure they take full advantage of all we are doing. We are pleased to welcome as many LGBT people as possible to join us in Madrid to celebrate in our city for World Pride — and right through 2017. We are looking forward to sharing such exciting industry opportunities with WTM London visit." WTM London, Senior Exhibition Director, Simon Press said: "The growth of the LGBT Village is something we are strongly committed to and by working with ONBC we continue to see new successes each year. LGBT travellers are a vital part of our global travel industry and WTM London is pleased to play our part in building successful business relationships that further great travel outcomes for LGBT people right across the world. We are very pleased this year to welcome World Pride Madrid 2017 to WTM as a Premier Exhibitor in ONBC's official LGBT Village at WTM. We are confident this will strongly benefit them, the travel industry and LGBT travellers as a result." The LGBT Village at WTM London sells out every year. Limited spaces remain for those businesses wanting to exhibit. To join the LGBT Village contact and secure one of the final remaining spaces. Exhibitors in the LGBT Village to date include: Welcome.LGBT, Two Bad Tourists, Madrid Destino, World Pride Madrid 2017, Out Now and Greater Fort Lauderdale Convention and Visitors Bureau.